This is not the first time that members of the Dalit community have been attacked for riding a horse as part of traditional ceremonies. New Delhi: A Dalit procession was allegedly attacked by upper caste men in Rajasthan’s Bhilwara district on Sunday night due to outrage over a Scheduled Caste groom riding a horse, according to an Indian Express report. “After we decided that we will bring a mare for the Bindoli procession of my younger brother Uday Lal, we started getting threats from the village. We submitted an application to the police following which they provided us security. But at the time of the attack, they did nothing,” said the groom’s older brother Bhanwar Lal Regar. For Regar, the incident brought back memories from eight years ago. In 2010, when he was part of a similar procession for his elder brother’s wedding, upper caste villagers had stopped them for the same reason and pelted stones at them. He alleged that most of the attackers were from the Gurjar community. “Around 40-50 people, all of them were from the Gurjar community attacked us,” said Regar. In Bhilwara, however, the police denied reports of inaction and said that seven people have been arrested so far. This is not the first time that members of the Dalit community have been attacked for riding a horse as part of traditional ceremonies. In fact, such incidents have routinely taken place place across India. In 2015, a similar incident of attacking a Dalit groom occurred in Ratlam, Madhya Pradesh. Certain upper caste members threw stones at a Dalit groom for riding a horse, following which they took away the animal with them. When the procession arranged for a second horse, the villagers came back to attack, because of which the groom had to wear a helmet all the way. Last year, upper caste men from the Rajput community in Haryana allegedly pushed a Dalit groom from his horse and beat him up for performing the ghurchari ceremony. In fact, less than a fortnight ago, in Madhya Pradesh’s Ujjain, stones were pelted at a Dalit groom who chose to ride a horse during his wedding procession. In this context it may be useful to recall the recent judgement by the Supreme Court regarding the SC and ST (Prevention of Atrocities) (POA) Act 1989 . On March 20, the apex court banned registration of criminal cases and automatic arrests of government officials as well as private citizens under the SC/ST Act. Perceived as a dilution of the existing Act, Dalit communities across India took to the streets, demanding that the Central government file a petition to reverse the apex court judgment. 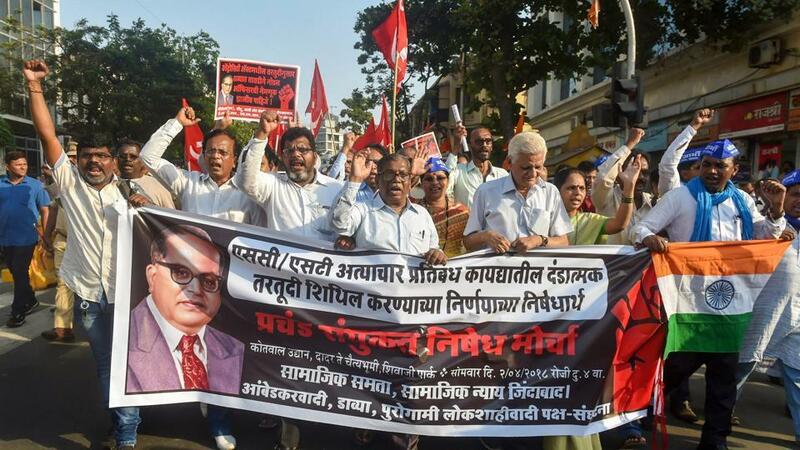 A Bharat Bandh was called by Dalit outfits and was marked by widespread protests, including incidents of violence in several parts of northern India, in which at least half dozen people were killed and property damaged.